Ding Ning made a successful world title defence, while Lee Sangsu is a surprise semifinalist. Title defended in Düsseldorf: Ding Ning won her third world title today in Düsseldorf. Combined with her Rio Olympic gold, people will now be discussing whether she is on her way to becoming the greatest female table tennis player of the modern era. She now has very large target on her back. Xu Xin doubles down: In Suzhou 2015 Xu Xin won the Men’s Doubles title with Zhang Jike. Here in Düsseldorf he won again, but this time with Fan Zhendong. While there have been rumours circulating about how safe his position is in China’s main lineup, he has now firmly established himself as their go to doubles pro. Sangsu surprise: Lee Sangsu was flying under the radar coming in to the World Championships. 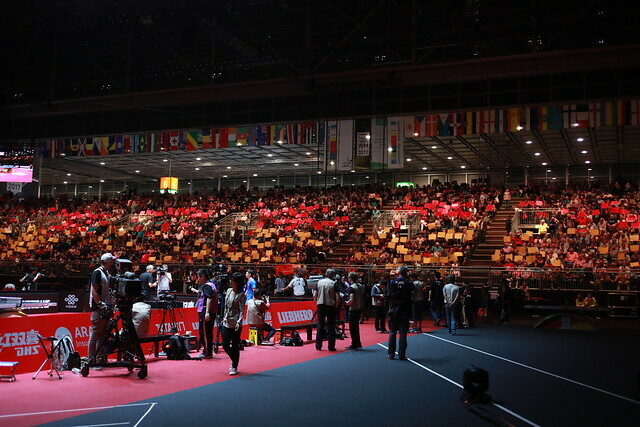 But he is now in to the semifinals after knocking out Zhang Jike, Vladimir Samsonov, and Wong Chun Ting in succession. Lee has been making some blistering backhands all week and he is easily one of the fastest players. But will it be enough to take down the beast that is Fan Zhendong? Fan favourites fall: Hometown heroes Timo Boll and Dimitrij Ovtcharov both fell short, going down out Men’s singles without a medal. The German team will most likely be disappointed, but with Boll running in to Ma Long and Ovtcharov encountering Niwa in god-mode, they can hold their heads high. They both put on a fantastic show for the fans. Meanwhile, wonder kid Tomokazu Harimoto is finally out of the draw. He doesn’t want us to mention his age, so let’s instead talk about his insane backhands. Xu Xin was able to find the answers, but in two years time one can only presume the questions will be a little tougher.